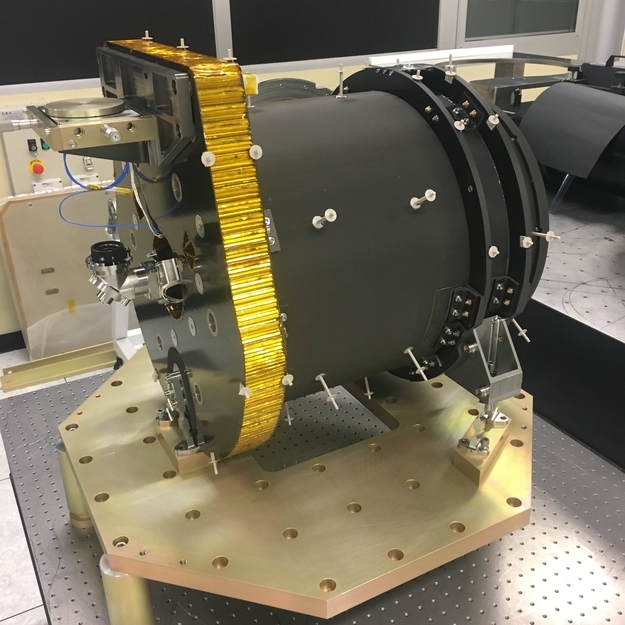 The flat, black surface at the rear of the CHEOPS telescope tube is the optical bench onto which the focal plane module, containing the CCD detector, will eventually be mounted. A silver-coloured, metal section of the back-end optics can be seen protruding from the centre of the optical bench and pointing upwards. Starlight will be fed by the back-end optics from the secondary mirror to the detector. The picture was taken at Leonardo-Finmeccanica, after integration of the telescope.